After making some ice cream, I had five egg whites left over so decided to use them to make macaroons. 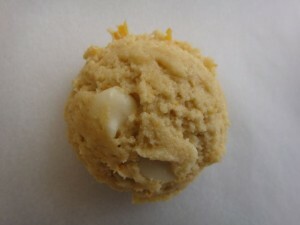 The Macaroon Bible uses sweetened condensed milk as a base for macaroons. One of the macaroon recipes in the book is for Stupid Macaroons. I decided to make them but, rather than throw in the potato chips called for, I used left-over Momofuku cornflake crunch. This made for a very unusual macaroon, indeed. In honor of one of my favorite Momofuku cookies, I named these Compost Macaroons. 2. In large bowl, combine milk and vanilla. Stir in coconut, pretzels, Cornflake Crunch and Butterfinger Bar. 3. Add egg whites and salt to bowl of stand mixer. Beat until very stiff. 4. Using a rubber spatula, fold egg whites into coconut mixture. 5. Using a cookie scoop, form into 2 tablespoon balls and place on parchment-covered baking sheets. 6. Bake about 20 minutes. Watch them closely and take them out when they are the shade of brown you prefer. 7. When they have cooled for a couple of minutes, remove to a cooling rack to finish cooling completely. *If you don’t have a scale, use about one cup of sweetened condensed milk. 1. Heat oven to 275 degrees. 2. Pour cornflakes into a large bowl and crush them with your hands to a quarter of their original size. 3. Add milk powder, sugar and salt. Toss to mix. 4. Add butter and toss to coat. The butter will act as glue, binding dry ingredients to cereal and creating clusters. 5. Spread the clusters on a parchment-lined sheet pan. Bake for 20 minutes, or until they look toasted, smell buttery and crunch gently when cooled slightly. Cool the cornflake crunch completely before using. Is Your Daughter Alive or Dead? The medics brought in a twenty-three-year-old woman unconscious with an overdose. They reported she had texted family members telling them she wanted to die. Then she took some pills, washed down with alcohol. It was obvious she was really intoxicated. As we watched her, it became clear she was not breathing well, which worried me, so I performed an intubation. This means that I passed a tube into her windpipe. She was then put on a ventilator and I arranged to have her admitted to intensive care. During this time, I asked multiple times if we had been able to reach any family. I was told no one had called us about the patient and we had no contact information for her. My shift ends at 7:00 am. Just as I was ready to leave, Mom walked in. She said she got the suicide text from her daughter, called 911, and then, went back to bed. As it turned out, Mom was a nurse at our hospital. At 7:00 am, she reported to work and got her assignment of patients for the day. She then decided to see how her daughter was doing. By looking on the computer system, she saw her daughter was headed to the ICU. Only then did she come down to the emergency department. I don’t understand this. Maybe Mom had so many problems with her daughter in the past she was not up to mounting a serious concern about her that morning. Maybe she didn’t even consider that her daughter might be seriously ill. Maybe she really didn’t care. I don’t know, but it is amazing to think she had a good night’s sleep, then got up and reported to work before checking to see if her daughter was alive or dead. As a side note, I faced an interesting medical dilemma in caring for this patient. I intubated her because she was so intoxicated she was not breathing well. Yet, as soon as I got her intubated, the irritation from the intubation caused her to wake up! She got agitated and began to bite on the tube and fight the ventilator. She would buck, eyes open widely but blindly, and bolt nearly upright in the bed. In order for her to relax and tolerate the ventilator, I needed to sedate her even more. It was like giving her more of the disease for which I was treating her! Still, I had to medicate her so she could be comfortable as she went upstairs. Last week, I shared a recipe I got from Six Sisters’ Stuff. Here is one that I also got from them. I adapted it a bit to come up with the recipe below. Made both as originally presented on their website and as adapted, below, they went fast in the Emergency Department. 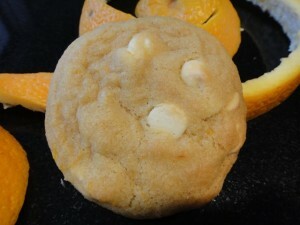 As with all cookies made with water-based liquid like buttermilk, they are soft and cake-like. 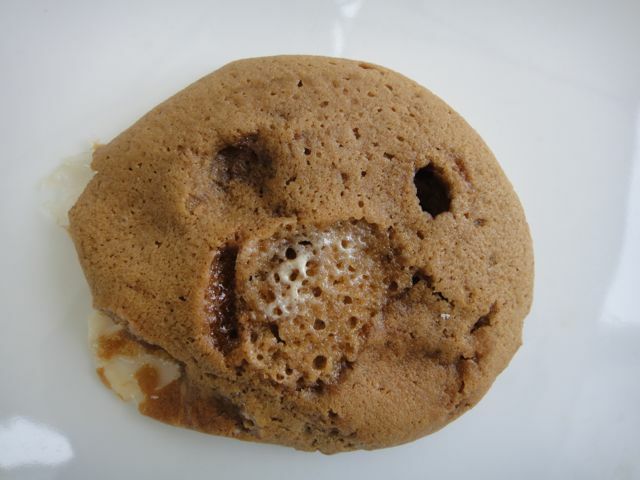 The marshmallows and root beer barrels melt so they are not uniform and are a bit of a mess to eat but I think they make the cookies are more interesting. How could anything be bad with cream cheese icing? No one at work guessed they were flavored with root beer. I guess it is nonspecific enough and not all that many people drink root beer so I was not surprised. What did surprise me was that I looked in eight stores for root beer barrel candy and no one had it. I guess is not very popular around here. I finally found them at a specialty candy store. 1. Heat oven to 375º. 2. In a mixing bowl, cream butter and brown sugar. Beat in eggs. Beat in buttermilk, root beer extract and vanilla. The liquids will not combine well with the butter mixture and it will look curdled. Don’t worry. 3. Combine dry ingredients. Gradually stir into creamed mixture. 4. Stir in candy and marshmallows. 5. Drop 2-tablespoonful balls onto ungreased baking sheets (I always use baking parchment papers.) Bake at 375º for 10-12 minutes or until set. Remove to wire racks to cool. 1. 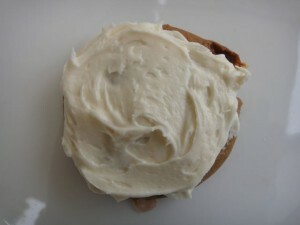 In a mixing bowl, combine all frosting ingredients. Beat until smooth. *I used Cook’s root beer extract, which I bought online. I am sure that McCormick’s, which they have in our local grocery store, would be just as good. ** I put them in a quart-sized zip-lock bag. I close the bag and put it on something hard. (I have an small anvil in the garage that I use.) I gently hit each candy once with a hammer to crack it into smaller pieces. A helicopter ambulance service called saying they were bringing in an eighteen-year-old man who had been stabbed in the chest. The radio report from the frantic flight nurse painted a picture of a very seriously injured person. He was confused and had a weak pulse and a low blood pressure. We quickly prepared for his arrival: trauma team called, equipment readied, blood ordered up from the blood bank. By the time they got him down from the rooftop helicopter pad and into the trauma bay, he was in his last gasps. All hands went to work at once. I sedated and paralyzed him so I could put a breathing tube in his windpipe. We could then get air into his lungs and provide him with oxygen. When it was clear that he had no pulse, a tech did chest compressions. The trauma surgeons put in large IV’s, through which he was given fluids and blood. It soon was apparent that all of this was not enough so a thoracotomy was preformed. This is similar to what is done when someone has open-heart surgery but is, obviously, simplified and done as rapidly as possible. A cut is made between two ribs on the left side, all the way through the chest wall, into the chest cavity. A spreader is inserted into the cut and positioned between the ribs. The ribs are then spread open so the surgeon can get to the heart. If the source of the bleeding is identified, it can be sewn closed. The heart can actually be squeezed by hand, which is more effective in moving blood forward than the chest compressions done during CPR. All of this was done quickly and successfully but was to no avail. His heart never started beating again and he was pronounced dead. When the decision was made to stop the resuscitation, a dramatic change took place in the feeling in the room. Immediately, all feverishly applied efforts to save a life just stopped. Rather than hollered commands and replies, voices were quiet and subdued. Rather than aggressive, heroic actions, activities moved to the mundane like cleaning up and preparing the body for the morgue. Telling someone his or her loved-one is dead is the worst part of my job. It is bad enough if the person was old and had lived a full life. It is really hard to tell parents their son was murdered with a stab to the chest and at such a young age. Thank goodness I didn’t know at the time that his brother was the person who stabbed him, during an argument over a video game. My mom and dad were born in Blanding, a very small town in southeastern Utah. They went back there for a visit over the 4th of July and came home with an amazing Tad Bag story. They dropped into a little chocolate shop on Main Street in Blanding. They somehow struck up a conversation with the other three patrons in the shop. They were vacationing from California and were just passing through town. As they chatted, my parents learned that one of the other three worked in another hospital here in our fair city. They kept connecting dots until they learned that several of her coworkers also worked in our emergency department. She had coveted the Tad Bags they carried to work at her hospital and had wanted, really badly, to get a bag of her own. I guess she was pretty blown away when my parents pulled out one of their bags and gave it to her. When she gets back home, she will head off to work with a Tad Bag she picked up in a chocolate shop in Blanding, Utah. Somehow, three people just happened into the same shop at the same time in a little town over a thousand miles from where they lived. They struck up a conversation and learned they both knew of me. Two were my parents. 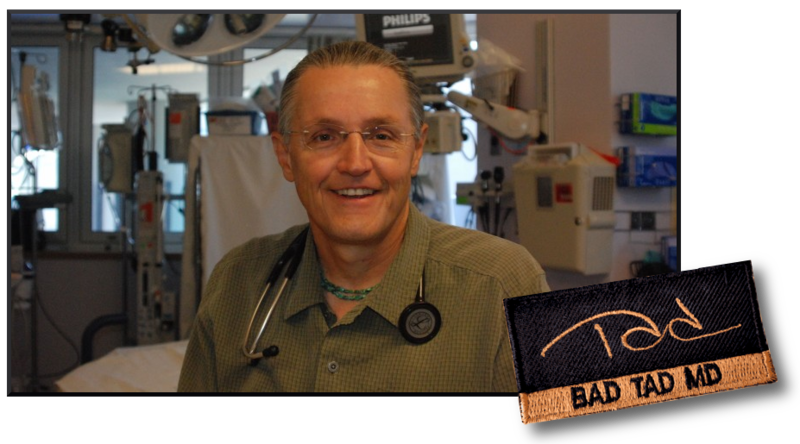 One knew me only as the emergency doctor who sewed bags from trauma straps. 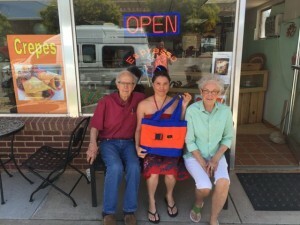 My parents just happened to have a bag, which they were glad to share with her. 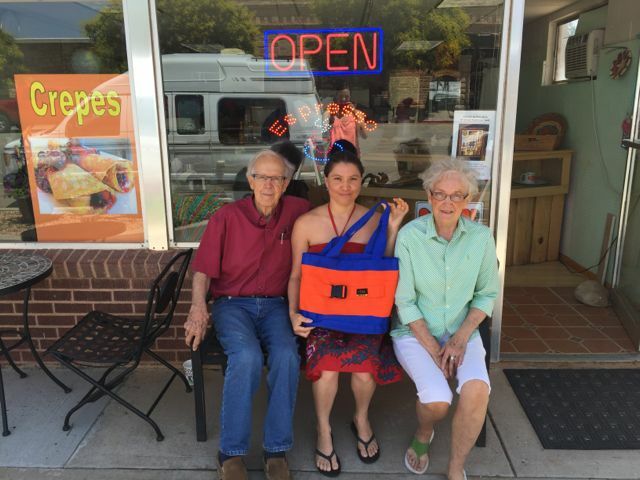 Here is a picture of Gina with Howard and Corine, my generous parents. When we went home for Fathers’ Day, my mother-in-law showed me a new cookbook her friend lent her: Six Sisters’ Stuff. I took one look at their picture and knew they had to be from Utah, based on their hairdos. On the fly of the book, sure enough, it said they were raised in Utah. I don’t know if I should be proud or embarrassed to be so familiar with Utah hairdos. I picked a couple of recipes, looked them up online on my phone and told my mother-in-law I didn’t need to write the recipes down because they were all online. She was amazed and even told her friend who lent her the book that I could find the recipes online. They were really impressed. It was my daughter-in-law, Elizabeth’s idea to try these this week. She recommended that we bake up some with semi-sweet chocolate chips rather than the white chips. It was a great idea but she liked the white chips better. They are very buttery! 2. In a small bowl, combine flour, baking soda, and salt. Set aside. 3. In a large bowl, cream butter and sugars until light and creamy. Beat in egg and vanilla until smooth. 4. Gradually stir in flour mixture until combined. 5. Stir in orange zest and white chocolate chips. 6. 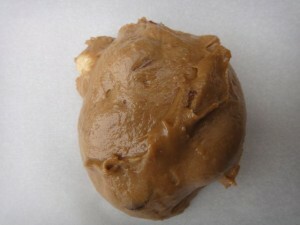 Drop 2 tablespoon balls of dough onto cookie sheets that are ungreased or lined with parchment. Bake 8 – 10 minutes or until golden brown around edges. Do not overcook! Cookies will be plump. Cool for several minutes on cookie sheets before transferring to rack to cool completely. In that story, a young man hung himself upside down, on purpose, to “dance.” The stress on his leg caused widespread breakdown of the leg muscles. This is a concern to us in the ED because damaged muscle cells cause proteins to leak into the blood stream. A high concentration of these proteins is toxic to the kidneys and can cause kidney failure. This condition is called rhabdomyolysis. An 88-year-old woman was found hanging by her legs out of the bathroom window. She was unable to say what happened to her, but those who found her believed she may have been there all night. When she arrived, she was very confused, dehydrated and both of her legs were swollen, discolored, and tender. A bone in one leg was broken, but that was the least of her problems. She had two very serious complications of having prolonged stress on her leg muscles. Like the “upside down dancer,” this woman had rhabdomyolysis and the risk of kidney failure. She also had a compartment syndrome in both of her lower legs. A compartment syndrome of the leg develops when there is damage to leg muscles, which are bundled in compartments made of strong fibrous bands. The damaged muscles tend to swell but the fibrous bands prevent the compartments for enlarging. This leads to increased pressure in the compartment. If this is not identified and treated, blood is unable enter the compartment and the muscles can actually die from lack of blood supply. 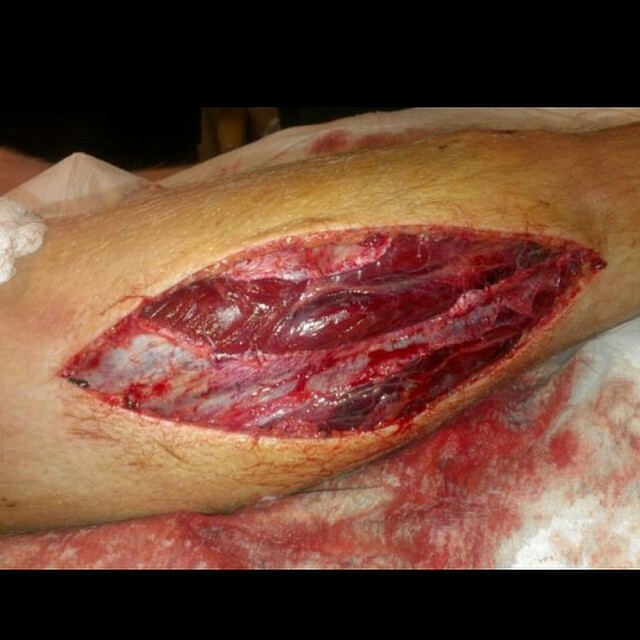 The treatment for a compartment syndrome is called a fasciotomy. Long cuts are made through the skin and the fibrous bands so the muscles have room to swell. These cuts are left open until the muscles heal. The defects can later be closed with skin grafts. This lady required fasciotomies in both of her lower legs before she was admitted to intensive care.